Got this oversuit as I have a Weise Jacket and if the suit is of the same quality that's good enough for me. Glad to say that it is. The fit is good and it works well in the rain. What more can I say? Bought but not yet used in rain. Purchased to keep in emergency in pannier. I'm 6.1 slim wearing Alpinstar Andes textile jacket, bought Extra Large and very happy with fit, selecting one size up. Very light weight and the 3rd of the size rolled up than my 20yr old Frank Thomas Aquapac! Didn't come with a black suit bag, just a retail clear presentation slip. Rolls up very small. Seems unobtrusive around the neck seal and suit fabric is not restrictive. The big yellow panels aid viz in poor light. Oversuit works well. 280 mile in rain last week and still dry at the end. Reasonable price too and fits in a small stuff bag. Take it with me all the time. I just needed a reasonably priced oversuit that I was only going to use occasionally. Unfortunately on a recent Europe trip it got used more than I was expecting it. It performed well keeping me dry, was easy to get in and out of quickly and stood up to the rigors of the tour without incident. Kept me completely dry in downpour. Fairly easy to put on, not so easy to get off but did the job for me. Was worried it will not fit over my textile gear but it fits perfectly. Easy to get in and out. Material looks solid with Velcro. I have not tested it in the rain this is why I gave it the good. Guess it will do the job perfectly. Weise gear works. A small storage bag to come with it is desirable. I give a good rating because since buying the item there's been no rain, however it fits well and is fairly easy to put on. If I get to wear it in the rain and it keeps me dry then I'll uprate to excellent. If I have a motorcycle jacket and trousers on underneath,how many sizes up from my chest size would you recommend I go? 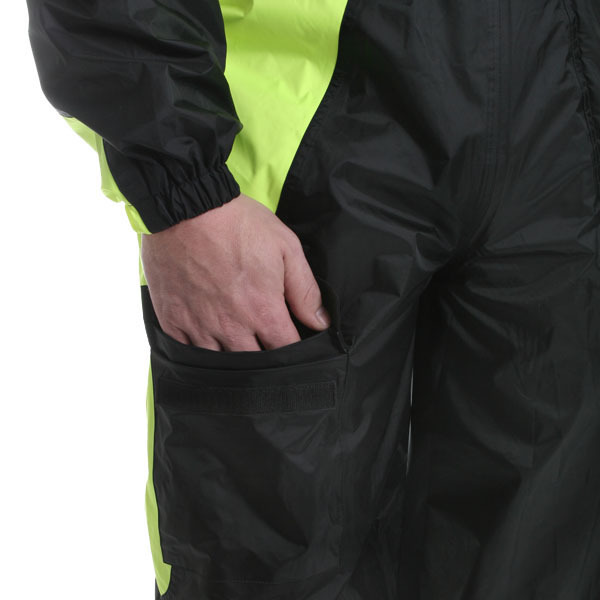 The Oversuits are designed oversize as standard, although we do find customers opting for a size above their standard jacket size to allow extra layers to be worn during colder weather. Would I need to order the same size as my jacket or go one size bigger? 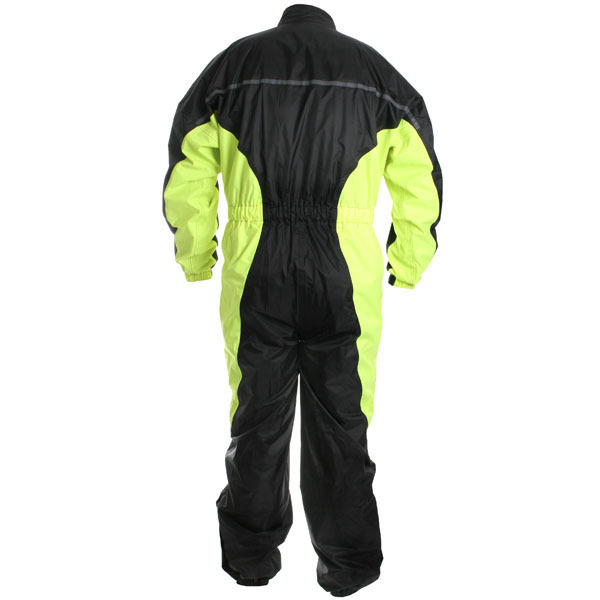 The over suits are designed oversize as standard. 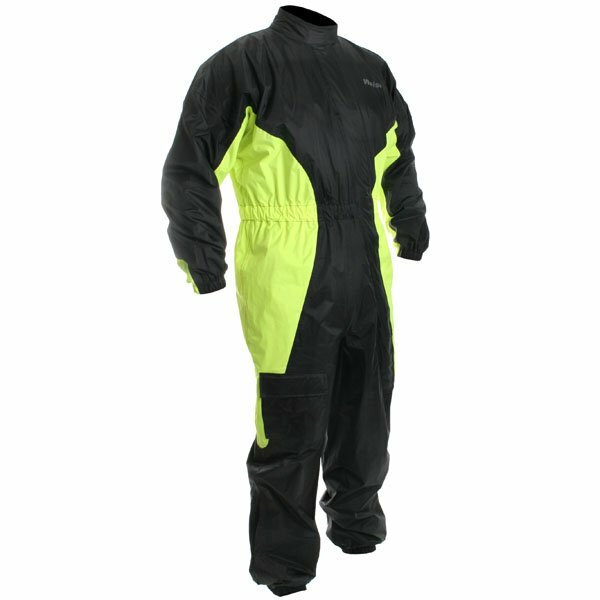 The Large size suit should accomodate a large size jacket. We do find customers opting for a size larger in order to wear more layers beneath if required.